Charms Creations are sponsors and guest designers over at CSI which is a great challenge blog if you haven't ever given it a try. Each week (roughly) you are given a case file with criteria to meet/choose from and let me tell you it is not nearly as daunting as it might sound! 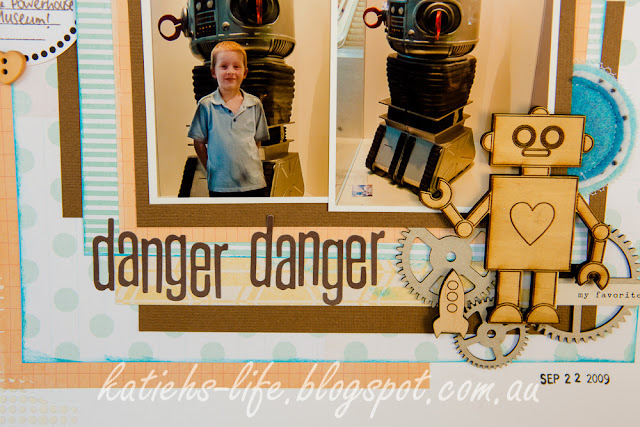 So, the first thing that came to mind was having a gorgeous robot wood veneer from Rainbow Splendour! And I also remembered that I had some older photos from the Powerhouse museum where we found "Robot" from Lost In Space! That gave me an easy start to this page! From the evidence I used: stripes, buttons, robot, cogs/gears and circles. And from the Testimony I chose to add buttons to my journal spot. Too easy! 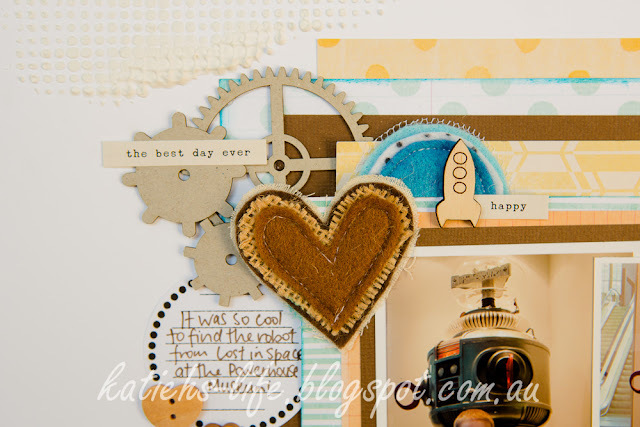 I have added two Charms Creations goodies on this page, a brown heart which was a perfect colour match and I cut in half a blue (kind of the right colour!) circle and layered in each cluster. Isn't the robot awesome?! The little rockets came with him too, they were easy to layer with the chipboard cogs. Make sure you go and check out the other case files for April there is sure to be something that grabs your attention!